A publicity shot of CKV250 outside the SS Cars building in 1937. This is considered to be the first recorded use of the Jaguar 'leaper' mascot. The SS Jaguar 100 is a British 2-seat sports car built between 1936 and 1941 by SS Cars Ltd of Coventry, England. The manufacturer's name 'SS Cars' used from 1934 maintained a link to the previous owner, Swallow Sidecar, founded in 1922 by Walmsley and Lyons to build motorcycle sidecars. In March 1945 the S. S. Cars shareholders agreed to change the name to Jaguar Cars Limited. In common with many products of the thirties the adoption of an animal name was deemed appropriate and the model name "Jaguar" was given to a new SS saloon car in 1935, and then to all new SS models. The '100' was for the theoretical 100 mph maximum speed of the vehicle. The chassis had a wheelbase of 8 feet 8 inches (2.64 m), and was essentially a shortened version of the one designed for the 2.5-litre saloon, a car produced in much greater numbers, and first seen in the SS 90 of 1935. When leaving the factory it originally fitted 5.50 or 5.25 × 18 inch tyres on 18 inch wire wheels. Suspension was on half-elliptical springs all round with rigid axles. The engine was a development of the old 2.5-litre Standard pushrod unit converted from side valve to overhead valve with a new cylinder head designed by William Heynes and Harry Weslake. The power output was increased from 70 bhp (52 kW) to 100 bhp (70 kW). Twin SU carburettors were bolted directly to the cylinder head. In 1938 the engine was further enlarged to 3.5 litres and the power increased to 125 bhp (93 kW). The four-speed gearbox had synchromesh on the top 3 ratios. Brakes were by Girling. The complete car weighed just over 23 cwt (2600 pounds, 1150 kg). On test by the Autocar magazine in 1937 the 2.5-litre (20 RAC hp rating) car was found, with the windscreen lowered, to have a maximum speed of 95 mph (153 km/h) and a 0–60 mph (97 km/h) time of 13.5 seconds. With the 3.5-litre (25 RAC hp rating) the top speed reached the magic 100 mph (160 km/h) with a best of 101 mph (163 km/h) over the quarter mile and the 0–60 mph (97 km/h) coming down to 10.4 seconds. In 1937 the 2.5-litre car cost £395 and in 1938 the 3.5-litre £445. The fixed head coupé, of which only one was made, was listed at £595. A few examples were supplied as chassis-only to external coachbuilders. Widely considered one of the most aesthetically pleasing sporting cars of the 1930s the SS100 is also very rare, with only 198 2.5-litre and 116 3.5-litre models made. While most stayed on the home market, 49 were exported. Cars in good condition will now regularly fetch in excess of £300,000. A near concours example was auctioned by Bonhams at the 2007 Goodwood Festival of Speed for £199,500. Due largely to its rarity, auction prices for the SS100 have since risen strongly. More recently a beautifully restored former Pebble Beach concours winning 1937 S.S. Jaguar 100 3½ Litre Roadster - was sold by Gooding & Co. at their August 2010 Pebble Beach auction. It fetched a noteworthy £666,270 ($1,045,000). It was on an SS100 that the famous Jaguar 'leaper', the marque's signature feline hood ornament, was first displayed. In mid 1936 the first version of the Jaguar mascot was reputedly described by Sir William Lyons, founder of the company, as "looking like a cat shot off a fence". A later publicity photograph of the new Model 100 "Jaguar" (registration mark CKV 250) parked outside the offices of SS Cars Ltd in early 1937 shows a revised Jaguar 'leaper' mounted on the radiator cap. It is this more stylised 'leaper' that became the trade mark for Jaguar Cars, Ltd., remaining in use to this day. The unnamed owner of the Belgravia vintage car dealer in James Leasor's 'Aristo Autos' novels, 'They Don't Make Them Like That Any More', 'Never Had a Spanner on Her' and 'Host of Extras', drives an SS100, and the car features prominently in the books. The late Alan Clark (1928-1999) MP owned an SS Jaguar 100, and during his time in Margaret Thatcher's government was often to be seen piloting his SS100 away from the House of Commons after late Parliamentary sittings. Of the 49 exported models, one notable example, CNP 947, was driven and raced by pioneering American television host Dave Garroway. His white 3 1/2 Litre car still bears the alligator hide trim on its instrument panel, seat surfaces and steering wheel from his ownership. Jaguar Motorcars provided Garroway the first XK 3.8 litre engine sold privately, a race prepared unit which remains with the car. At Gooding's January 2017 auction in Scottsdale, Arizona, the Garroway SS100, with both the XK engine and a correct 3 1/2 litre Standard engine, sold for £493,000. A number of Jaguar SS100 replicas and recreations of varying material quality and execution have been manufactured since the 1960s. Significant makers include the Birchfield Motor Company, the Steadman Motor Company, Suffolk Sportscars and the Finch Motor Company. In recent years, even these replicas regularly bring in excess of £50,000. In 1982, the first Birchfield Sports was produced but it was only intended to be a one-off. A company called Shapecraft in Northampton, UK, then developed the concept further as a (small) production-run vehicle using Jaguar XJ6 mechanicals, with the looks of the SS Jaguar. Due to the complexity of the design, and the advanced degree of engineering knowledge needed to deal with the Jaguar parts, the car was not very successful as a kit car. For this reason, only 18 were ever produced in the UK. After production ceased in the UK, a Shapecraft employee emigrated to Australia taking with him the Birchfield drawings and the last production car (#18) to use as a pattern. By 2004, at least two cars had been completed in Australia and two more were in production. The Steadman TS100 manufactured during the late 1980s and early 1990s by Ottercraft Ltd in Hayle, Cornwall, United Kingdom, is described as a 'reproduction' of the SS100. The actual build numbers for this car are unknown, but it is thought that a maximum of twenty-eight of these vehicles were assembled, and were also referred to as the Jaguar Steadman TS100. The Steadman TS100 was never intended to be a replica of the SS100 of the 1930s, but was designed to be a sports car in its own right. With a hand-built aluminium body, the Steadman TS100 used unadapted Jaguar XJ6 running gear and was sold as a high quality, more modern version of the SS Jaguar 100. Dimensionally and visually, the Steadman TS100 was quite different from the original SS Jaguar 100. These differences occurred because the manufacturers were forced to change the original proportions to both accommodate the wider track of the donor car and allow the use of more readily available smaller, wider wheels. Attention was paid to styling detail during design (such as the use of appropriately large headlights) and at the time of production, the Steadman TS100 was regarded as more successful than most other evocations. With an unknown number surviving, this re-creation is a rare sight at classic car events. The Steadman TS100 Enthusiasts Club was established in 2011 to maintain the vehicle's marque and to bring together owners from around the world. Suffolk Sportscars are based in Woodbridge, Suffolk, United Kingdom and build glass-reinforced plastic (GRP) SS100 replicas. Upon receiving an order, the replica car is built individually by hand to the customer's own specifications. Alternatively, a replica may be ordered in component form for skilled home assembly. The Suffolk SS100 uses the Jaguar XK6 engine, and commonly the 4-speed Jaguar 'Short Compact' gearbox as the drivetrain. Some examples of the Suffolk are built with automatic transmissions, 5-speed gearboxes or in LHD. The company are now even able to offer further modern comforts such as electric power steering and air conditioning. The Suffolk SS100 is still in limited production today with 8-12 cars being produced each year with exports to a number of countries including the USA, several European nations, Australia and New Zealand. The Suffolk Sportscars SS100 is probably the most prolific replica of the SS Jaguar 100. In Fact, as of 2017, Suffolk Sportscars Ltd. report to have built over 315 examples of their Suffolk SS100, therefore outproducing the original SS100s production run of 314 vehicles. The Finch Motor Company is based in Mount Barker, South Australia. Finch's approach to the Finch SS100 is somewhat different to the other SS100 replica manufacturers. Finch endeavoured to recreate their Finch SS100 as faithfully as possible and do not use the XJ6 as the base donor car. Finch sourced original factory drawings and build their SS100 chassis to the original design. The bodies of the Finch SS100 are made from aluminium metal-shaped to fit the traditional wooden frames built by Finch. Finch SS100 mechanicals are sourced from 'deceased' MkIV and SS Jaguars to obtain contemporary components. A Finch SS100 won the Australian Concours d' Elegance. : In 1978-79 in Rome Georgia the company Autotech was formed by Terry Short to produce the Front engine Jaguar SS100 Replica. With the assistance of Wain Bates, Lee Wilson and Steve Little as well as eight employees, the cars were constructed using a custom designed steel frame with rear mounted integrated fuel cell and powered by a straight six naturally asperated 300CI Ford engine and mustang 4 speed transmission bodied with modified Antique & Classic Cars Fiberglass body panels. Rear suspension was Mustang axel on coil springs and Carmen Gia front torsion suspension with disc brakes. The car was equipped with 21 inch true spoke wire wheels with four bolt Ford pattern lugs, produced by Dayton Wire Wheel company in Dayton Ohio. Instruments were copied from the original Jag dash and even used a Lucas built paddle switch for headlights. The plant was in the Packard dealership building in Rome Georgia. The company Produced sixteen cars VIN numbered starting with #AT318. The company also produced four Fraizer Nash bodied cars powered by the 1600 Ford motor. It is unknown if any examples of these cars exist today. ^ "Motor magazine insert for the 1936 SS Jaguar range". The Jag-lovers Web. Jag-lovers Ltd. Retrieved 13 September 2014. ^ "1938 show-stopper: William Lyons' Jaguar SS100 3.5-litre Coupé Prototype". Classic Driver. Classic Driver (Switzerland) AG. Retrieved 12 August 2013. ^ a b c d Culshaw; Horrobin (1974). Complete Catalogue of British Cars. London: Macmillan. ISBN 978-0-333-16689-5. ^ "First Cats: The predecessors of Jaguar Cars Ltd". The Jag-lovers Web. Jag-lovers Ltd. Retrieved 27 July 2015. ^ "1938 S.S. Jaguar 100 3½ Litre". Supercars.net. Supercars.net Publishing. Retrieved 13 September 2014. ^ Paul Skilleter, Jaguar Sports Cars, p.305 ISBN 0-85429-166-0. ^ Sedgwick, M. (1989). A-Z of Cars of the 1930s. Devon, UK: Bay View Books. ISBN 978-1-870979-38-2. ^ Cheetham, Craig (2004). Vintage Cars - The Finest Prewar Automobiles. Rochester, United Kingdom: Grange Books. p. 181. ISBN 1840136359. ^ "1937 SS Cars 100 SS auction sales and data". Conceptcarz.com. Conceptcarz.com. Retrieved 27 July 2015. ^ a b c "Birchfield Sports". Brightwells Auctioneers and Valuers. Brightwells Limited. Retrieved 27 July 2015. ^ a b c "Welcome to the Steadman Jaguar TS100 Club". Steadman Jaguar TS100 Enthusiasts Club. Steadman TS100 Enthusiasts Club. Retrieved 27 July 2015. ^ "Suffolk SS100". Suffolk Sportcars. Suffolk Jaguar. Retrieved 27 July 2015. ^ a b c "SS100 Replica". Finch Restorations. Finch Motor Company. Retrieved 27 July 2015. ^ a b "The Birchfield Story". Birchfield Motor Company. Birchfield Motor Company. Archived from the original on 8 April 2005. Retrieved 27 July 2015. ^ "Buying a Birchfield". Birchfield Motor Company. Birchfield Motor Company. Archived from the original on 8 April 2004. Retrieved 27 July 2015. 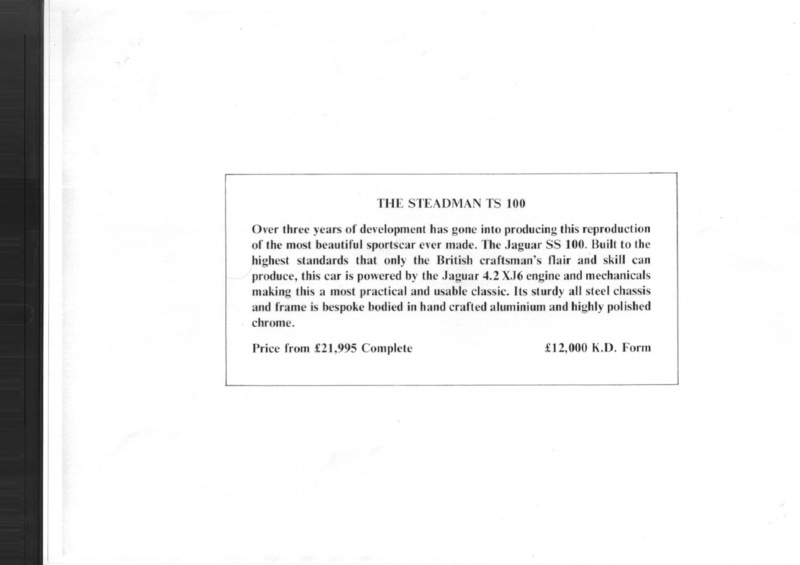 ^ "THE STEADMAN TS 100". Steadman Jaguar TS100 Enthusiasts Club. Steadman TS100 Enthusiasts Club. Retrieved 27 July 2015. ^ Lawrence, Mike (1996). A to Z of sports cars, 1945-1990. MotorBooks International. p. 336. ISBN 978-1-870979-81-8. Retrieved 21 August 2011. Wikimedia Commons has media related to SS Jaguar 100.